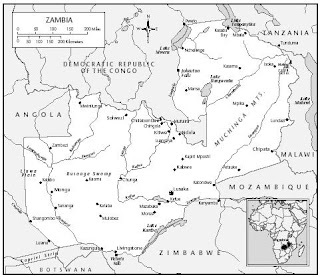 Whenever I tell people in Sunderland and Amherst and the surrounding areas about my placement in Zambia, many ask me where exactly is Zambia, how large is it, and how many people live there? So, I decided to devote this blog to informing those not familiar with Zambia with demographic, geographic, and other interesting cultural tidbits to orient them, as well as me, to the background, yet very pertinent, information that will help me in my placement. I found this really nice map on Everyculture.com and thought it nice to add it here as a way of helping everyone visualize the location of this country on the African continent. 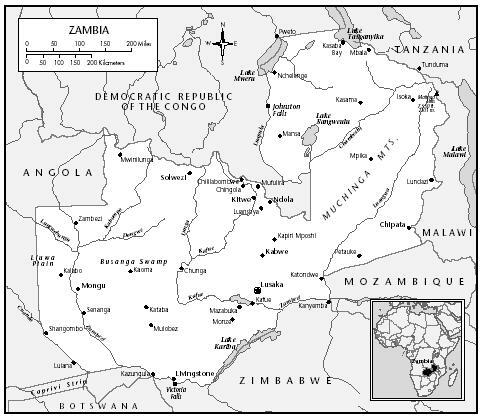 As you can see from this map, Zambia is landlocked and is surrounded by neighboring Mozambique, Angola, Botswana and Zimbabwe to the immediate south, Tanzania, and the Democratic Republic of Congo to the north. As I have mentioned in other blogs, Lusaka is the capital city and is very modern and populated. The country is made up of wildlife, undulating hills and mountains, and natural water resources. The Victorian Falls, located in the southern region, is one of the main destinations for enterprising tourists. Because most development takes place in the major cities of Zambia, most of the 9.87 million people living around the country reside in cities. In fact, almost half of the population are in urban areas, where most of the jobs are. Rural residents, who rely primarily on subsistence farming, comprise most migrants, but Zambia has also accepted refugees from the Democratic Republic of Congo and Angola. Although Zambia is known for being a British colony (1924-1964), it was also occupied by other European nations, such as Portugal, and has had its fair share of missionaries. David Livingstone, to whom one of the cities is commemorated, was an industrious missionary, who fought to end slavery in Zambia. There are seventy five different tribes residing throughout the nation who live relatively peacefully with each other. The main tribes are the Bemba, Nagoni, Lozi, Chewa, Chokwe, Lunda, Luvale, Tonga, and Tumbuka, which also reflect the major geographical languages. The large ethnic diversity, however, is mediated by the "One Nation, One Zambia" ideology, promulgated and promoted by former President, Kaunda. The food culture is another important and interesting characteristic of Zambia, but is best left for another blog date. Fundraising note: Many thanks to my cousin, Abe, who donated yesterday. His gift brings my total to $255.